It certainly doesn’t seem like twelve months since I was sitting in Helsinki for the first time and listening to an afternoon, outdoor Jazz concert. It wasn’t what I expected of that city at all. And it looks like we may be doing more business in that part of the world over the rest of the year. I hope so. I know y’all won’t care but I’ve said before that the primary reason for the existence of this site is for me and as a kind of diary/journal. The fact it is online is probably the incentive that makes me keep it up. The fact that you occasionally comment makes it feel more worthwhile. Ever since I introduced the ‘on this day’ link against relevant entries on the homepage I’ve found a great memory jogger. I end up re-reading entries from this day last year – or the year before. 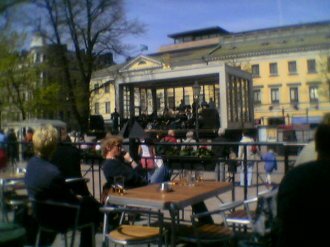 It certainly doesn’t seem like twelve months since I was sitting in Helsinki for the first time and listening to an afternoon, outdoor Jazz concert. It wasn’t what I expected of that city at all. And it looks like we may be doing more business in that part of the world over the rest of the year. I hope so.